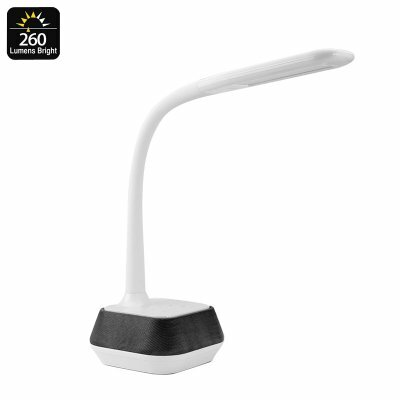 Successfully Added Bluetooth Speaker LED Lamp - Adjustable Brightness, Energy Efficient, Flexible Arm, 260 Lumen, 75dB, 7W Speaker to your Shopping Cart. This stylish LED table lamp features an intergraded 7W Bluetooth speaker. With this speaker, the lamp is capable or producing up to 75dB of sound. Simply synchronize it with your mobile music library and enjoy your favorite tracks. Bluetooth transmission guarantees lag-free music any time you turn on your LED light. From now on you’ll always be able to light up your room while comfortably listening to one of those all time classic tracks. The LED light itself produces up to 260 Lumen which is enough to light up your near surroundings. Thanks to its sensitive dimmer, you’ll always be able to adjust the brightness to fit the occasion. Its high performance LED light source produces plenty of light and is energy efficient. Working on a low 12V DC power supply, it allows you to save up to 80% energy compared to regular LED lights. This table lamp Bluetooth speaker features a simple yet fashionable design. It comes with a flexible arm so that you can always adjust the direction of the light. Featuring a 30.000+ hour lifespan, you can be guaranteed that this LED light will serve you through numerous years. This LED lamp is the perfect electronic gadget for those of you that wish to listen to music while simultaneously enjoying a source of natural light. This Bluetooth speaker tablet light comes with a 12 months warranty, brought to you by the leader in electronic devices as well as wholesale electronic gadgets..